I wasn’t sure about the pilot, while I laughed at the dialogue, and felt the premise had potential, I hated the characters. Despite that ambivalence I stuck it out for the rest of the season, although if it had been longer than 8 episodes, or I had other things that were just half hour long, I probably wouldn’t have bothered. So, has anything changed since I watched the pilot? No. This is gonna be a very short review. 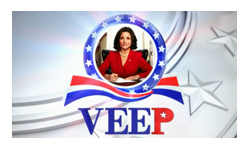 My dilemma from the pilot was uncertainty about whether the Vice President was as stupid as her colleagues, unfortunately it turns out she is. I really wish they’d made the other choice, there’s plenty of good, smart comedy mileage to be had from the smart person surrounded by fools. Instead she and her co-workers manage to not only be incompetent at their jobs, but also for the most part pretty unpleasant people happy to sell each other, and their principles completely down the river for their own agendas. Of course those agendas are usually trying to cover up, or recover from their previous incompetences, but of course their ongoing stupidity means they fail in their cover-ups and the whole thing spirals depressingly out of control. The only positive is that the show continued to have some solid dialogue – really brutal, witty insults and comebacks between all the characters, just the kind of thing you expect from the writer of The Thick of It. But it just isn’t enough. The fact that I made it through the season at all is actually a bit of a mystery to me, I can’t actually remember why I didn’t give up as soon as the second episode turned out to be reducing itself to the level of diarrhoea jokes. I won’t be back for season 2.